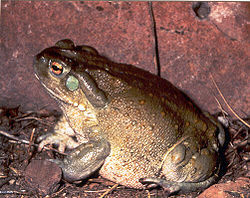 A few times in my blog entries, I’ve mentioned toads — poisonous toads — specifically, the Sonoran Desert toad, commonly known as the Colorado River toad. When I was a girl, being a tomboy through and through, ants and toads and frogs and salamanders, even crayfish, were fascinating to me. Where I grew up, though, ants were black and didn’t bite, rattle snakes weren’t around every corner, and toads were cute and harmless. I knew you didn’t catch warts from touching toads or frogs. I always put them back where I’d found them after taking a closer look, and even when they peed on me (in what I now know to be a fear and stress-induced reaction) it was no big deal (the pee, that is). With the continuous (and heavenly) monsoon rains still upon us, the Colorado River toads have been coming out in earnest on the ranch. On the one hand, they’re great to have around; eating bugs, including scorpions, they make it safer outside for my terriers. On the other hand, the larger rescue dogs are obsessed with everything that moves — butterflies, birds, rabbits, toads — and would like nothing more than to catch them all. Essentially, the male toad finds a puddle (left from misters, rain water, or even your dog’s water bowl) and uses it like a hot tub, serenading the females with his best mating call. Even when you can’t see them, you can hear them singing. Their arrival on our porch is heralded by the sound of rattling chain-link fence as they (astonishingly) squeeze themselves in and out of small spaces. 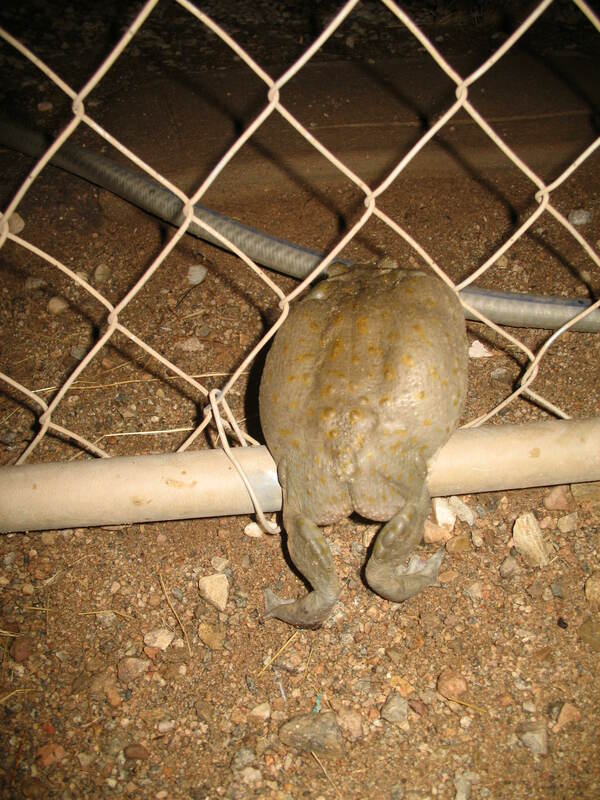 In the photo below, this big, squat toad is making its way out of our dog kennels after finding the water bowls dumped and turned over. A toad soaking in a dog’s water bowl can leave behind enough poison to kill a dog. The toads’ weapon is a milky venom housed in glands on their neck and thighs secreted when threatened, but even their skin is poisonous. It’s very clever, actually, as the toads parade around without fear under the visage of owl, hawk, coyote, bobcat and javelina. Some people actually “lick” these psychoactive toads for the high, although this method can be lethal to the person doing the licking. More so, the toads are milked (illegally) and their venom dried into “chips” which are then smoked. The most likely scenario, however, is your dog being poisoned from either catching a toad in its mouth and absorbing the venom, or eating the toad, along with the poison glands. Such was the nightmare last weekend when two of our rescue dogs, Clementine and Blue, caught a toad that hopped fearlessly into their midst, and, like a game of hot potato, passed it back and forth. I ran after them in a frenzy, yelling and slipping in the kennel until my legs were bruised and bleeding. My husband, hearing the ruckus, tore out of the house and between the two of us, pried the toad out of Clementine’s mouth. I was soon to see the symptoms I’d been telling my husband about only the day before, coincidentally having come across a local toad avoidance class advertised online and reading about the treatment for poisoning. It saved the dogs’ lives that night. First of all, don’t panic. (I know — easier said than done.) If your dog has eaten all or part of the toad, bring the dog to the vet IMMEDIATELY. Many sources cite a thirty minute window before the poisoning can prove deadly, acting upon the heart and causing cardiac arrhythmias and arrest. If your dog had the toad in its mouth only, remove the toad and immediately rinse your dog’s mouth with water, from the corners of the mouth outward to avoid the dog swallowing the poison. Use your fingers to swish water between the gums and cheeks where poison could pocket. Rinse for fifteen minutes with a hose. After rinsing our dogs’ mouths, the saw-horse gait, dilated pupils and hallucinations stopped, and the dogs were back to normal after fifteen minutes. 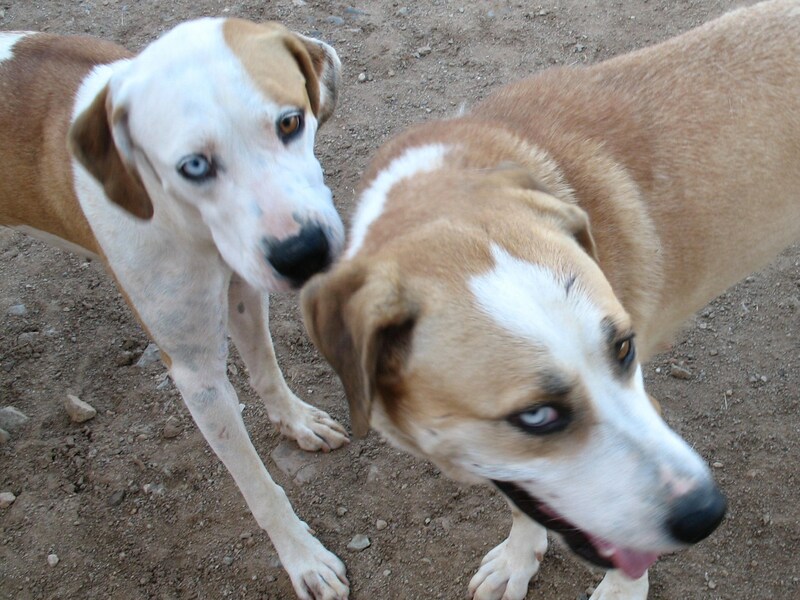 We called our vet, who told us to keep an eye on the dogs for the next hour, during which no symptoms reappeared. The best treatment, of course, is avoiding these toads altogether, with supervised outings at dawn and dusk during monsoon season, (the toads hibernate the rest of the year), along with bringing any outside dogs inside at dusk and keeping your dogs inside until sun-up. What surprises me the most about these toads is their fearlessness — going where other small animals fear to tread. Unfortunately, prior poisoning doesn’t usually keep dogs away from the toads; our vet spoke of seeing the same dogs multiple times for toad poisoning. — Dump out and turn over dogs’ water bowls when not in use. 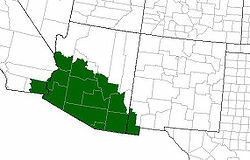 Bufo alvarius United States range map (the toad also lives in northwest Mexico). Having lost my beloved cat, dog and horse last summer, my greatest wish this summer was for all the animals to come through it alive and intact, including the toads. So far, so good.